Clayton, our Assistant Manager at the New Bedford, MA branch, was recently named the Bristol Community College (BCC) 2018 Distinguished African American Alumnus of the year. While studying business administration at BCC, Clayton took multiple part-time jobs to support his brother, following the tragic loss of his father. 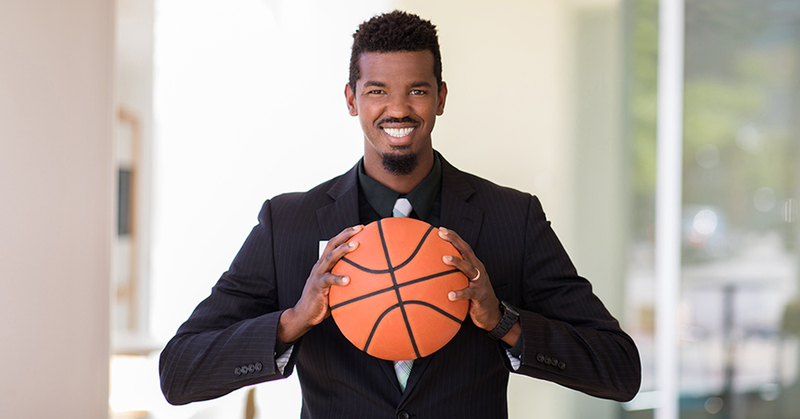 Clayton has supported his community for the past five years as a dedicated Amateur Athletic Union (AAU) basketball coach. He assisted players on and off the court and instilled in his team that the word “student” comes before the word “athlete.” We sat down with Clayton to learn more about his inspiring story. Tell us a little bit about your background, how were you able to juggle school, work and taking care of your brother? I was born in Sal, Cape Verde, where my brother and I were raised by my mother. My father moved to the US in search of a better life when we were very young. Once he purchased a home and found work as a truck driver, he asked my mother to let my brother and me come live with him in the US. She agreed that it would give us the opportunity for a better life. We moved here in the summer of 2002. I was in the 8th grade; my brother was in the 7th grade. We spoke no English when we moved here; we were placed in bilingual classes until my junior year of high school. During my freshman year of high school, my father was diagnosed with a rare disease that attacked his liver. He battled the disease and was able to get a new liver transplant by my junior year of high school. However, it would slowly reject his body leading to his passing while he was vacationing in Cape Verde during my senior year of high school – a few months before my graduation day. After his passing my brother and I lived on the first floor of the home while my stepmother lived on the second floor. I would work at the local YMCA and a local pizza shop to have money for food and other expenses while giving my stepmother half of the monthly mortgage payments; we eventually lost the house. At this time my brother had graduated high school and was working, so we could afford an apartment along with my now wife. A family friend introduced me to the new head basketball coach at BCC during that time. It was the first year BCC ever had a basketball program. I was able to attend school during the morning, work second shift and be at basketball practice for 9 pm almost every day. What inspired you to volunteer to coach, and what would you say to others who are looking to volunteer? From playing basketball, I was able to cope with my father passing. I also learned from my coaches and others around me who encouraged me to keep going. They would go out of their way to help me and give me advice. That led me to staying in school and continuing my education. I developed a passion to coach others in hopes that I can change someone else’s life, like others did for me when I was in need. I would say to others that are looking to volunteer—go out and do something for somebody, give something back to somebody. Something so small like giving your time can go a long way to changing somebody’s life. In my free time I play basketball, enjoy weight-lifting and training kids I coach, but most of all I like spending quality time with family. At Citizens Bank, we are committed to empowering our colleagues and providing them with a network of supportive peers. Learn more about life at Citizens to see if you would be right for a role among the ranks our great colleagues, like Clayton. © 2018 Citizens Financial Group, Inc.